'As Graham states the commission for the painting stemmed from a series of coincidences. An original photograph of the Secunderabad MG squadron (incorporating the MG sections of the Deccan Horse, Poona Horse and 7 Dragoon Guards) was ripped into four pieces by my grandfather in his old age and thrown into the bin. My cousin rescued it, gave it to me and in 2010 I had it pieced together and restored professionally. 'A week or so later I met Graham regarding a Medieval picture of his. During our conversation he asked me where my interest in military history came from. Remembering the photograph, I explained that among other reasons I had been piecing together my grandfather's WW1 service history. Graham asked me what regiment he served in and, when I said the 7DG's, we were both somewhat stunned when he revealed that he was taking part in a memorial ride at High Wood in three weeks' time, where he would be on horseback wearing the regiment's uniform. It was the first I'd heard of the event or the wood and I simply had to be there. 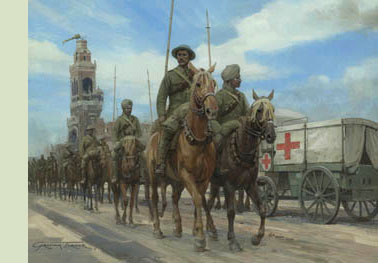 Another coincidence had been the appearance of Graham's painting "A Long Way from Home" a week before we went to France, This depicts the Indian cavalry moving through Albert. Throughout my grandfather's life he retained a great respect for the Indian soldiers he'd known and served alongside; presumably seeing the Deccan Horse charge alongside the 7DG at High Wood had helped reinforce that respect. As I watched the riders, including Graham, approach High Wood I had a wild thought; would Graham consider painting the battle? Well I think we all know the answer to that! His painting surpassed all our expectations. In commissioning him we knew we'd have a painting which would benefit from his reputation for extensive research and attention to detail, but there is so much more. It's an excellent, interesting, active, colourful and thoughtfully composed painting in its own right, with many different narrative's visible within it, not all of which are immediately obvious. For example, one of those surrendering Germans looks suspiciously like a certain artist! On a sombre related note, quite what my grandfather's émigré German foster mother, and her sister, who had brought him up in Chiswick since the age of four, thought about his war service isn't known but it can't have been easy for any of them. 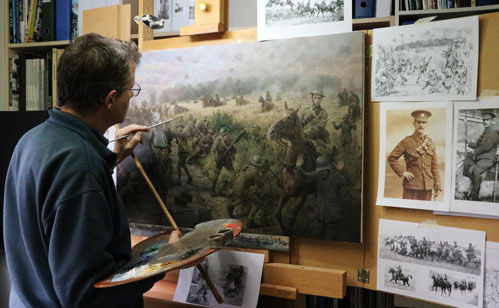 CLICK HERE to return to the main 'The Charge at High Wood' page, which gives full details of the painting and the story behind it. Also discover how it was created, with stage-by-stage photos following the painting as it evolved from a blank canvas. 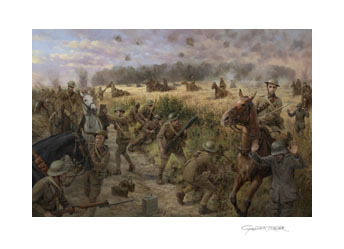 'The Charge at High Wood' is available a very high quality giclée print, reproduced on paper or canvas. Each print is individually printed and signed by the artist, Graham Turner, ensuring a result that is as close to the original as possible. 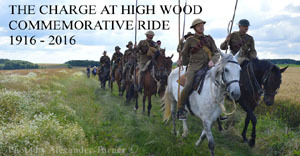 In July 2016 Graham Turner visited the Somme to take part in a ride commemorating the centenary of the Charge at High Wood. CLICK HERE to discover more about the only cavalry action of the Battle of the Somme and read Graham's account of his experiences retracing the cavalry's steps a century later.